PLEASE NOTE: On demand videos expire 180 days from the time of purchase. After 180 days, you will no longer have access to the video. 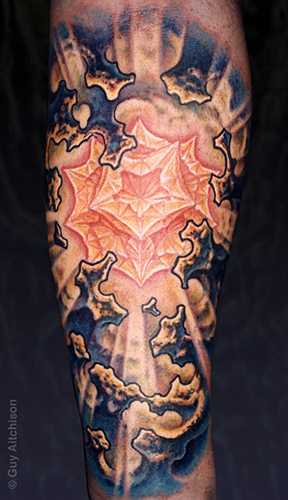 Guy visited Off The Map Tattoo in Grants Pass, Oregon and presented his seminar, Structure, where he did a large calf piece that included both abstract and representational elements that also employed a whole range of techniques. This one gets quite nuts-and-bolts technical about all stages of the process, with an emphasis on giving the piece a clear and strong overall visual structure.